The Springer (also known as a Stinger or Tornado) is by far the most popular for farm use due to its good performance and very flexible construction. We can offer you some excellent complete kits which give various mounting options and a choice of large (5') or small (3') Springer. Happily, you don't really need to know the ins-and-outs of the technicalities of CB's - we have put together a good selection of package deals, which not only include proven kit that will all work together - it'll save you a few pounds and make you elligible for a few special offers! Click Here To View Our Package Deals! An extension speaker can make a real difference if your machine is loud and your CB is tucked away with it's internal speaker obscured. Place one behind your head or facing you - i've seen them fitted in all manner of places... we do all sorts of types and sizes of speaker, so even if you've only got a tight space for one, we can hopefully supply you one that will fit! 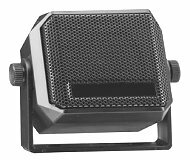 We get a few requests from customers who have purchased a modern CB, for microphones WITHOUT any of the buttons on them. The idea of having channel change buttons on the microphone is good, but if the mic is small (some previously available Midland sets had very dainty microphones) or if you are wearing gloves, it can be hard not to change channel by mistake occasionally. The current crop of sets seems to have addressed this problem, the Midland sets now have much "chunkier" mics with buttons on the top surface (48 Excel still the exception), but the Maycom has its (many) buttons on the front and top. We also supply noise cancelling mics which are ideal for noisy machines and the noise is getting transmitted, and power mics to boost up a quiet set or just to give control over the volume of the transmitted sound. We have a lot of different microphones on this site - this is just a few, if you want to discuss any of your choices of equipment, we are a real company, not just a website, so give us a call on 01306-881137 to discuss! An SWR Meter will allow you to fine-tune your aerial, and make sure you're earth connection is ok. This is a cheap, small and easy to use test meter - you don't need to know the technicalities behind it - just how to use it and interpret the readings - you can find out more about SWR and how to use the meter in our SWR Information Page. 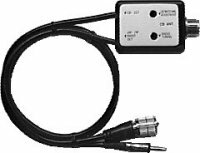 We can supply a CB/Radio Splitter - this is a neat little box that allows you to use your CB aerial for both the CB and the car radio. This unit has a couple of screwdriver-adjustable trimmers, so you can tune for maximum efficiency on the FM broadcast band, and if used with a largish aerial, should actually improve reception on your car radio, as well as making only one aerial necessary. It has a socket on one end for the standard CB aerial plug from your aerial, and two short leads coming from the other end - one going to your car radio, with a standard card radio plug - the other goes to your CB. These leads are quite short so if your CB and stereo are more than a foot apart, you will need an extension lead for one or other of them. Unfortunately we do not do a box that allows a CB to be used on your car radio aerial - it's not really possible. Amplifiers are not legal for use on CB in this country, but some people do use them for when they need that bit of extra range, especially if using a relatively small aerial. The chances of getting caught are fairly slim nowadays - most police officers don't really know what CB is (you might even have to remind them that CB is NOT covered by the recent hands-free legislation regarding mobile phones, if you do ever get stopped). It's only if you are running really large amounts of power, annoying other users, causing interference or you are unlucky enough to be caught in a multi-agency random stop (usually only reserved for trucks and minicabs), that you run the risk of getting caught - so the choice is yours! What amplifiers do is increase the transmitted signal power, giving you more range. There are some amplifiers available that amplify incoming signal also, but they are fairly ineffective for farm vehicle use as they amplify everything, and can make any received interference worse.